Scenic and elegant golf club restaurant serves up contemporary American fare. : By the sounds of the crashing waves, you know that the picturesque coastline of Newport Coast is just down the hill, but here on Pelican Hill you only see golf greens and the wide blue Pacific in the distance. 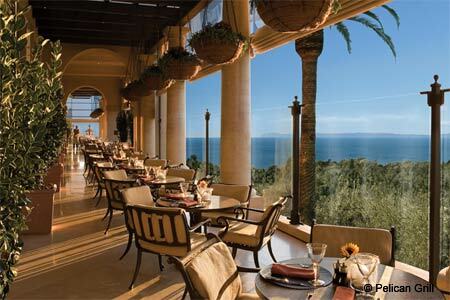 Situated inside Pelican Hill Golf Club, Pelican Grill is part upscale golf clubhouse and lounge and part fine dining restaurant. The open, elegant space's relaxed vibe flows strongly from the spacious open kitchen, where executive chef Marc Johnson and his crew can be routinely spotted having a good time. Johnson's contemporary cuisine extends this feel, as his lunch and dinner menu is built around flavors that are approachable and satisfying. Enjoy lunch by pairing a microbrew with a gourmet pizza or a glass of wine and a roasted prime rib-eye sandwich. The signature spicy tortilla soup is also good; it comes with shredded chicken, cotija cheese and avocado purée. At dinnertime, starters like the crab cake with green curry emulsion or the massive bruschetta trio featuring flavors like goat cheese, date and bacon are simply prepared yet deceptively complex. For mains, the bounty of seafood found in the cioppino will fill you up with or without its optional pasta, while the braised short ribs with creamy polenta, baby carrots and cippolini onions are as classic as it gets. Guests might choose to bypass the primary dining room and head straight to the lounge, where sports games are on two big-screen TVs --- it's a well-liked spot for taking a breather after a day on the adjacent world-class golf course.